Lawn envy is a real thing. If you spent 2017 looking at your neighbours’ beautiful, pristine lawns and wishing you had your own, then why not make 2018 the year your garden gets an overhaul? Get ready to kick off your thongs this summer and enjoy picnics on your new, lush grass. Choosing your turf is one of the biggest decisions you’ll make, though. Get it wrong, and you’ll end up having invested in something that doesn’t look its best, feel as good or survive well. 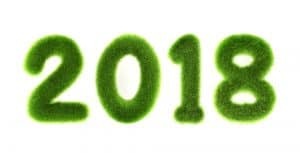 Before you choose your turf, check out our favourites for 2018. Empire Zoysia is fabulous for the Central Coast and other coastal areas. Empire Zoysia’s popularity in 2018 is rising, as people are looking for the best of both worlds – a finer leaf that is soft to the touch but still able to retain its water and be just as hardy, if not harder, than some of the broad-leaf varieties. Empire Zoysia is also low maintenance, making it easy to look after and completely eco-friendly. Kikuyu remains a popular, hardy lawn choice in 2018. A budget friendly option, Kikuyu lawn grows fast and recovers well, meaning it’s great for high traffic areas. It goes dormant in winter, meaning you won’t have to find a dry window of opportunity just to mow your lawn in the cooler months. However, you will need to mow it often in the warmer weather when it grows vigorously. Village Green Kikuyu is a more premium variety that requires slightly less mowing. There’s a reason why most people have heard of Buffalo turf. Buffalo has held its popularity across Australia as being a popular type of lawn. Buffalo comes in a variety of types, but in 2018, the Palmetto turf continues to be the most popular amongst Sydneysiders. It has a gorgeous emerald green colour and can withstand harsh drought periods that Australia is known to have. Couch varieties have always been popular due to their softer, finer leaf that make them lovely to kick off your shoes and sit on. Some of the varieties can be difficult to maintain, and with ever-growing busy schedules you need something that requires little handling. The Conquest Couch is the answer, as it’s a couch variety with just the right amount of toughness, giving it that soft touch but with a broad enough leaf to withstand foot traffic and harsher climates. Since 1974, Hi Quality Turf has offered a wide range of popular residential and commercial turf varieties to homes and businesses such as Buffalo Grass, Conquest Couch, Empire Zoysia, Kings Pride Buffalo, Palmetto, Sapphire Turf and Kikuyu. We understand how important it is that your grass is beautiful, maintainable and on-trend in 2018. We deliver turf supplies within Sydney, Wollongong, Newcastle and the Central Coast. Contact us today on (02) 45 723 666 to choose your new lawn.